Before I went to Morocco I had never eaten a pistachio. The closest I had come to a pistachio was in the Jello pudding my dad ate. But, once I ate one, well I was hooked – and a little upset that I had missed out on this delicious nut for the first 20 years of my life. I’m making up for it now. Like the lemon, vanilla, and almond ghriba I shared earlier this week, these ghriba are gluten-free and delicious. Pistachios have a unique flavor that some people really don’t like. As I began to look for a good flavor to pair them with I struggled. What I remembered about the pudding my dad loved was that the pistachio pieces were a strange consistency. They weren’t crunchy and they weren’t soft – they were something in the middle. I hated that texture. I succeeded with these cookies. The outsides have just a little crunch, while the insides are soft but not mush. I know not everyone has rosewater, so if you don’t you can use vanilla. 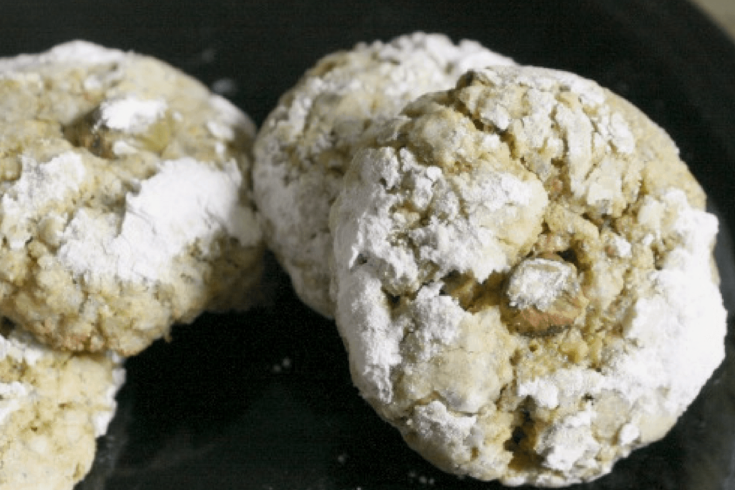 Gluten free Moroccan ghriba cookies with the flavors of pistachio and rosewater. In a food processor, blend the pistachios until they are broken down to almost a powder. 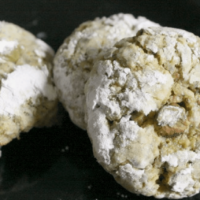 In a large bowl combine pistachio flour, granulated sugar, and baking powder. Add to the dry ingredients the rosewater and egg yolks. Line a cookie sheet with parchment paper or a silpat sheet. 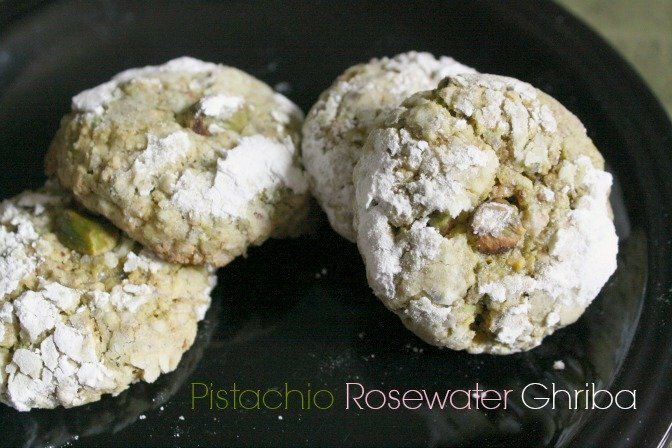 Arrange cookies on baking sheet and gently press a pistachio into the top of each. Do not flatten the cookies, they will naturally shape. It is very important to refrigerate or freeze the dough before baking. If you do not the cookies will melt and not retain their form. When you say two cups of pistachios. Do you mean bakers cup or normal cup (same for sugar).Do you know what would be approx weight? I am planning to substitute with premade pistachio flour rather than making my own. Do you think it will work ? What temperature you bake them? I mean bakers cups like a 1 cup measure. I’d say to reduce the amount a bit if you’re using pistachio that’s already ground – maybe go for 3/4 cup. Does this recipe also make 20-24 cookies? Was it a simple, almost like fruit salad? I know of a dessert with oranges and nuts and rose water or orange blossom water and sometimes cinnamon. Does that sound familiar? Yes, it was something like a fruit salad. And yes that does sound familiar.. do you have the recipe? What is it called? Thanks for so much for responding! Hi Amanda. These look great. One thing here, should the butter be 4 tablespoons instead of teaspoons? (Your vanilla almond receipe asks for 4 tablespoons). You’re right it’s a typo! Fixed now!